The IT Krew: What is a Desktop PC? Is a personal computer in a form intended for regular use at a single location, as opposed to a mobile laptop or portable computer. Prior to the widespread use of microprocessors, a computer that could fit on a desk was considered remarkably small. 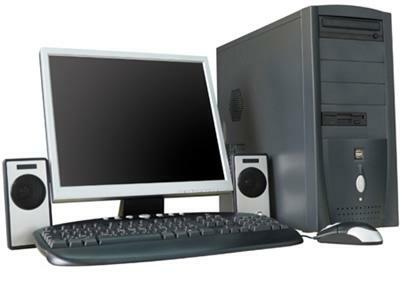 Desktop computers come in a variety of types ranging from large vertical tower case to small form factor models that can be tucked behind an lCD monitor. A desktop can also indicate a horizontally-oriented computer usually intended to have the display screen placed on top to save space on the desktop. Most modern desktop computers have separate screens and keyboards. Tower cases are desktop cases in the earlier sense, though not in the latter. Cases intended for home theater PC systems are usually considered to be desktop cases in both senses, regardless of orientation and placement.